Defining intelligence is highly problematic. Was Einstein smarter than Mozart? Are either smarter than Shakespeare? What about Gandhi and Buddha? Intelligence is a broad and complex entity—and nearly impossible for neuroscientists to study. We do know that there’s an area in the very front of the brain—the prefrontal cortex (PFC)—that’s important for the qualities most people associate with intelligence. The PFC is important for logic, rational thought, abstract thinking, concentration, planning, and impulse control—the latter colorfully demonstrated when a three-foot iron pole blasted through a man’s forehead in 1848, sparing his life but leaving him rude and irritable. But as important as the PFC is for intelligent human behavior, there may be one process that doesn’t really need it—creativity. Charles Limb and Allen Braun from the National Institutes on Deafness and Other Communication Disorders (NIDCD) used functional magnetic resonance imaging (fMRI) to examine the brains of jazz musicians while the latter improvised and played memorized pieces. Their results, published in the February 27 issue of PLoS ONE, suggest that during improvisation, the musicians essentially shut down a large portion of the PFC. 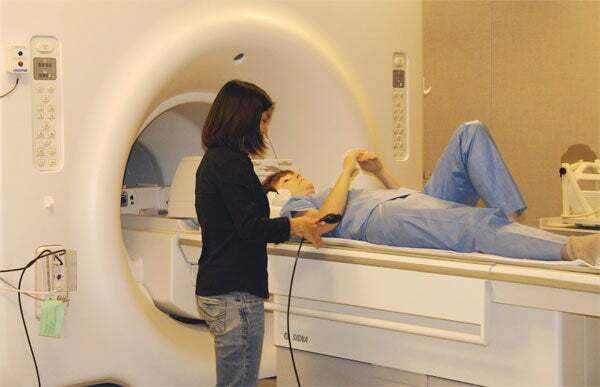 Getting a musician to play the piano inside an fMRI machine is not an easy task. The musicians had to lie on their backs with their heads and torsos inside the machine, resting a plastic keyboard on their knees. The researches then placed a mirror over their eyes and gave them headphones so they could see and hear what they were playing. The musicians played both improvised songs and memorized songs while in the scanner, and the resulting fMRI scans recorded the amount of change in neural activity—increases and decreases—between the two versions. The researchers found that much of the change between improvisation and memorization occurred in the PFC, the region of the frontal lobe of the brain that helps us think and problem-solve and that provides a sense of self. Interestingly, the large portion responsible for monitoring one’s performance (dorsolateral prefrontal cortex) shuts down completely during improvisation, while the much smaller, centrally located region at the foremost part of the brain (medial prefrontal cortex) increases in activity. The medial prefrontal cortex is involved in self-initiated thoughts and behaviors, and is very active when a person describes an event that has happened to him or makes up a story. It makes sense—in order to unleash their creativity, artists need to stop thinking about what they’re doing and just “feel the music.” Perhaps that’s what’s keeping the rest of us robots out of Carnegie Hall—we just think too much. We follow rationality and logic and try to achieve goals. As anyone who’s read an artist’s biography is well aware, creative geniuses are bad at articulating what inspires them—at least in a way that the rest of us can relate to and try to attain. Those who receive and act out such genius must, accordingly, shut down any capacity for premeditation or over-analysis—it is, perhaps, the fundamental nature of their gift. And their vastly superior auditory acuity and coordination probably don’t hurt. maybe they’re just better than you. I believe this is a very limited explanaton about the mental process(es) at work during improvisation. Jazz musicians are trained to think fast. Analize all the John Coltrane chorus on “Giant Steps” (an extremely difficult tune to improvise on, played at very fast tempo) and you can notice that he thinks about what he is doing. I think that a musician playing a keyboard inside a fmri machine is not a very good example of what “playing jazz” is all about, don’t you think?